Temperatures here in Boulder finally reached above freezing. Naturally, girls were walking around in sun dresses and flip flops. Boys had on swim trunks, and there was a party to burn all our winter gear. That's all entirely false, except for the above freezing moments of the day. Unfortunately, we've dropped back down to 30, but the veritable heat wave got me feeling a little frisky about my nails. 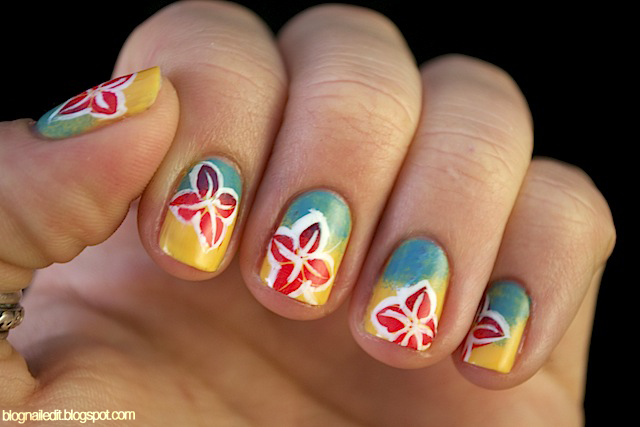 I also drew some inspiration from The Illustrated Nail's Ankara Prints. Tropical prints and the colors that come with it are too much fun not to play with. The base layer is Pull Over from Sinful Colors. It's sponged with Flyin' High (China Glaze), then stamped with Hey Sailor, also from China Glaze. The plate's RA-109 (again). The outlining is Sinful Color's Bad Chick. I'm hoping for the holidays I find some nail art brushes in either my Christmas or birthday bags, because some of that outlining is hard to look at. On a side note, starting with this post, I'm resizing my images to be the maximum width of my blog's text body. When Blogger resizes the photos for you, it loses color, and my hands end up looking more white and sad than they are in reality. Resizing outside of Blogger retains the color, and with the larger width of the body, the details aren't lost. So very summery! I didn't realize that the colour changes when Blogger re-sizes photos. :O Thanks for the heads up!